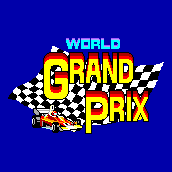 World Grand Prix / The Circuit (ザ・サーキット) - Games - SMS Power! 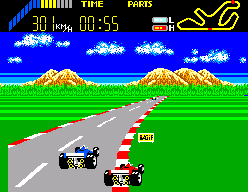 The tracks in the game match 12 of the 16 used in the 1976 Formula One season. 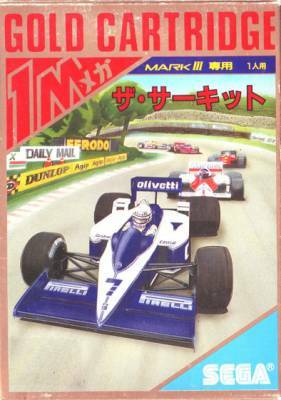 The Japanese cover art seems to depict the 1985 season, with Nelson Piquet's number 7 car in front of Alain Prost's number 1. 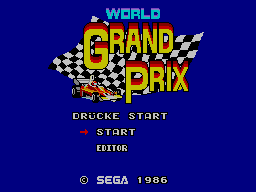 The game does not identify the countries, tracks or drivers as it is not licensed. 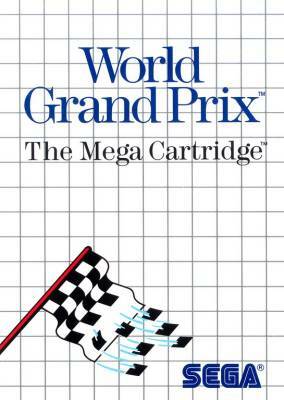 Design some of the hottest Grand Prix race tracks in the world. 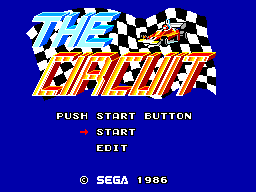 And hit them fast in the hottest wheels ever to fly across the home video screen. 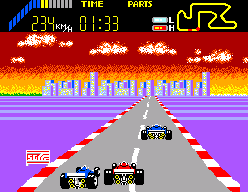 Your speed and daring will determine the race. If you're one of the top five finishers you can use your money to purchase even more supercharged parts for your car. You win again. You get more parts. Making your car hotter. And hotter. So nothing can stop you from nabbing the world championship. Except maybe the car that just pulled up beside you.